He didn’t receive any offers as a three-star running back recruit coming out of Oklahoma’s Jenks High School in 2015. He didn’t receive any Power-5 offers coming out of junior college a few years later. He didn’t receive an invite to the 2019 NFL Scouting Combine after a standout year in 2018. 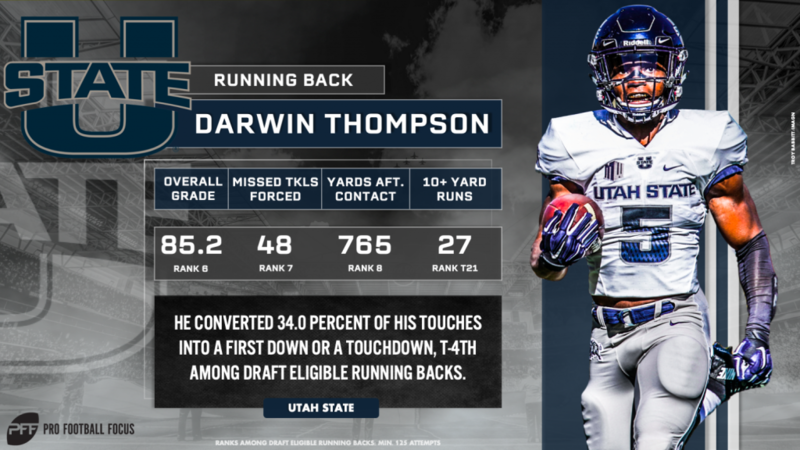 Utah State alumnus Darwin Thompson, a top-15 running back in terms of overall grade this past season, is used to being overlooked, used to being the underdog. And he wouldn’t have it any other way. Thompson, while flying under the radar with the Aggies in 2018, gained 1,210 yards after contact and forced 61 missed tackles across his 175 touches. He ranked fourth in forced missed tackles per touch (0.349) and second in yards after contact per touch (6.91) among the 210 FBS backs with 100 or more touches on the year. Though limited to just 151 carries this past season, Thompson ranked eighth in forced missed tackles per rush (0.318) and sixth in yards after contact per rush (5.07). His ability to make defenders miss in the open field and remain upright through contact is among the best entering this year’s draft. Looking specifically at his receiving ability, where the 5-foot-8, 200-pounder will make most of his money in the NFL, Thompson led all 83 FBS backs with 20 or more receptions in yards after contact per reception (18.5) and forced missed tackles per reception (0.542). Thompson, however, has no intention of limiting himself as just a third-down back or a receiving back. He believes he can do it all.